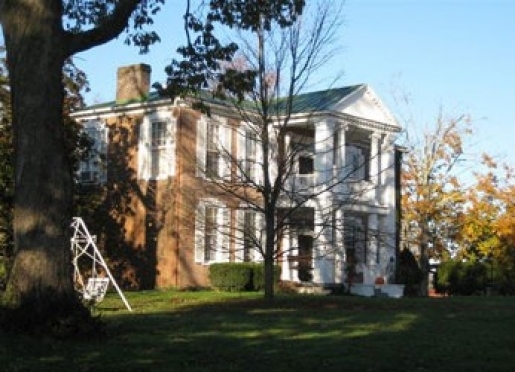 As you wind your way along the Kentucky Bourbon Trail, take your lodging at Myrtledene Bed & Breakfast in Lebanon, Marion County, Kentucky. We are an Official Site on the Bourbon Trail and a chapter in our local Civil War and John Hunt Morgan history. 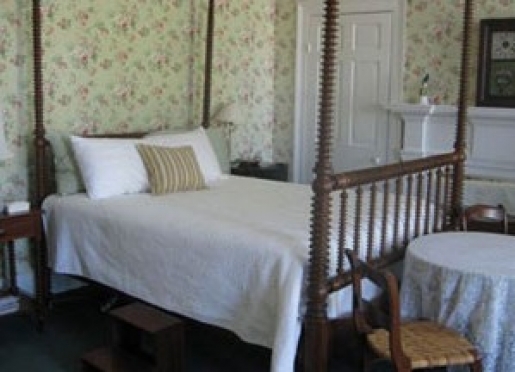 Let us be your restful inn while you tour this area known for Civil War history, antiques, natural scenery, and outdoor activities. We are the heart of the Kentucky Holy Land, the settlement of dozens of Catholic pioneers who traveled from the British Isles, through Maryland, to make a home among the knoblands of Central Kentucky. This area has been the birthplace and home of such notable religious figures as Martin John Spalding and Thomas Merton, monk of Gethsemani Abbey. 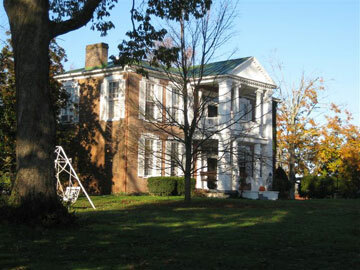 Myrtledene has been designated a Kentucky Landmark by the Kentucky Heritage Committee. General Morgan was so enamored with Myrtledene that he chose to spare it when his Raiders burned and looted much of Lebanon, a Union stronghold. In fact, it was here where the white flag of truce was flown atop a pole used to clean the tall ceilings. Today's "raiders" can use Myrtledene as their headquarters as they come to experience traditional Southern hospitality and visit the many area attractions. Travelers are always looking for memorable and relaxing experiences. Let’s discover more through the words of our innkeepers. Many thanks to James for sharing his own secrets with BBOnline.com! We are situated on the Makers Mark end of the Bourbon Trail. In fact, we are only about an hour from ALL the distilleries on the Bourbon Trail. 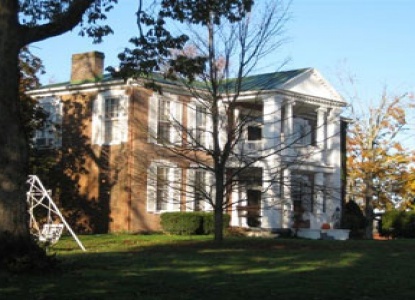 We are also close to the Perryville Battlefield, Gethsemani Monastery, the Loretto Motherhouse, Centre College, St. Catharine College, Campbellsville College, and many historic sites within the so-called "Kentucky Holy Land". What are you best known for? What makes your inn unique? What do you love most about your inn? 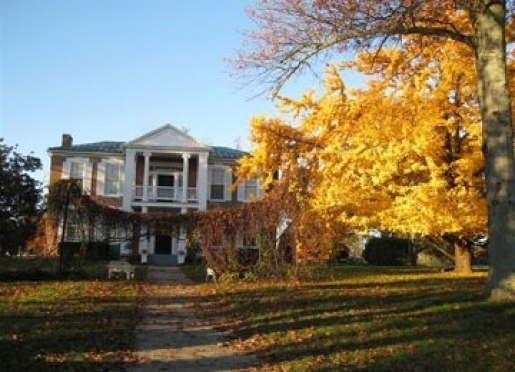 Myrtledene was built in 1833 by the founder of Lebanon, Benedict Spalding. 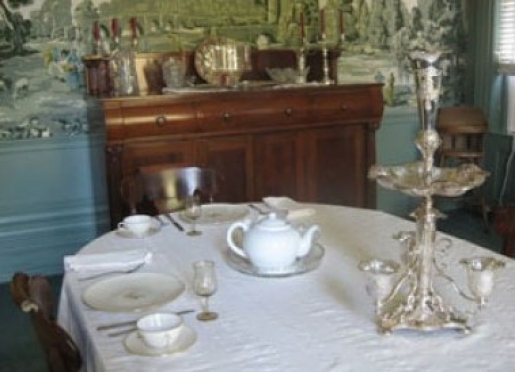 He and his wife Elizabeth were the wary "hosts" of Confederate Gen. John Hunt Morgan who used the home as his headquarters during two of his famous raids on Lebanon, a town on the L&N rail line that was also a major Union training ground. 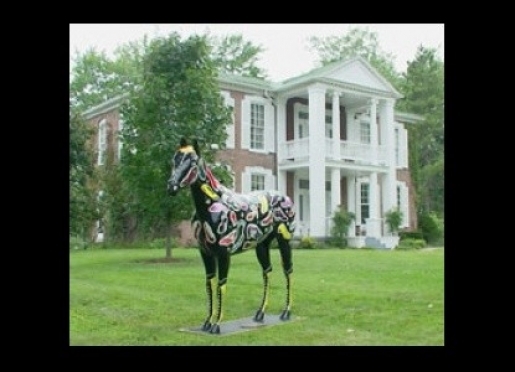 In one noted episode, Gen. Morgan rode his horse into the foyer and up the front stairs, leaving hoofprints in the treads. 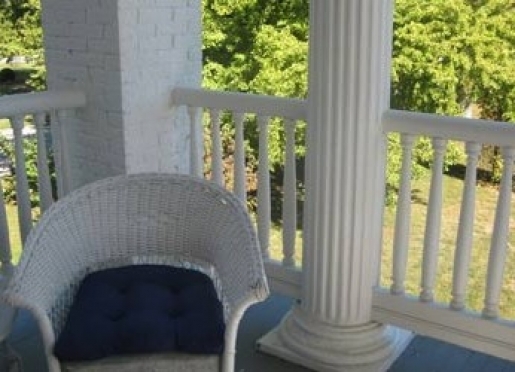 Mostly, I love Myrtledene for its striking Greek Revival architecture, the large yard, and the personal family connection I have to it. I grew up a few houses away and was a frequent guest here. Lebanon loves visitors. You may be encouraged to move here if you strike up a conversation with a local at one of our downtown gathering spots. That "local" may even be TV's "Turtleman" who lives here. 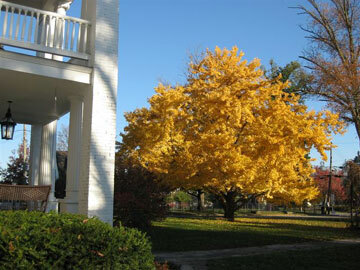 Lebanon is a historic and charming town that marks the geographic center of Kentucky. Come for the history of our past as well as the living history of bourbon and barrel-making right here in town. You can tour a cooperage and observe the ancient art of cobbling together white oak into charred whiskey barrels that make bourbon what it is. There's even a wine cooperage in town that is our connection to that other tourist trail, Napa Valley. The kindest remark passed along to us by one of our guests is "the best breakfast I've ever had." The best kept secret of this place may just be the outdoor activities. We have a gem of a nature trail around Fagen Branch Lake that is well-loved by the locals. At least once, have dinner at the best BBQ place you'll ever find, Brothers Restaurant in Campbellsville. See the art of Sr. Jeanne Deuber at the Loretto Motherhouse. Walk, hike, pray, retreat where Thomas Merton (The Seven Storey Mountain) made his home, Gethsemani Monastery. Sit a spell on the front porch of the oldest store in America, Penn's Store; you might even time your visit to coincide with their annual Outhouse Blowout, replete with outhouse racing. Of course, hit our Makers Mark Distillery and as many of the other stops on the Bourbon Trail as time allows like Buffalo Trace, Four Roses, Wild Turkey, Jim Beam, Woodford Reserve, or Town Branch. And, about two minutes from Myrtledene is our own craft distillery, Limestone Branch. They are making bourbon, moonshine, and flavored moonshine like their mega-hit Moon Pie Moonshine. Take a 4 mile hike around beautiful Fagan Branch Lake. Kentuckians know that the best horse racing in America takes place a mere hour from here at Keeneland Race Course in Lexington. Oh, yeah-- grab a Slaw Dog and slice of aged cheddar at Cut Rate Liquors. 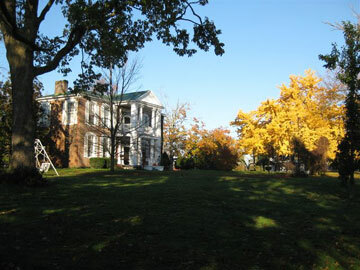 Myrtledene is four short blocks from downtown Lebanon which is a National Register Historic District. The best restaurant within 20 minutes is Brothers Restaurant in Campbellsville (www.brotherskentucky.com). I like swimmingholes.com, kybourbontrail.com, The Complete Guide to Kentucky State Parks by Susan Reigler and Pam Spaulding, Kentucky's Sheltowee Trace by Johnny Molloy, and A Benediction of Place by Clyde F. Crews. No, we do not accept pets inside the house. Myrtledene is also the site of numerous weddings and receptions each year. Our three acres right in town offer ample space and convenience to handle you and your guests. Call to arrange your special event. We are available as a backdrop for your photo shoot. 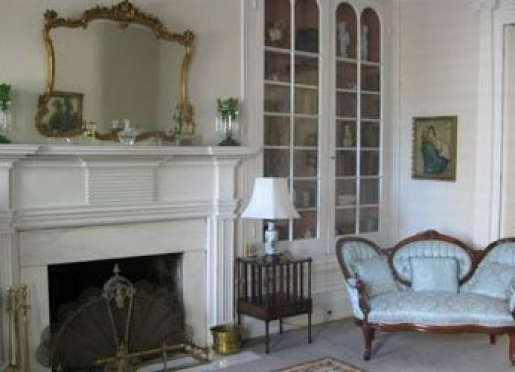 Our rates for a three-hour session are $35 for the grounds only and $55 if using the inside of the house. 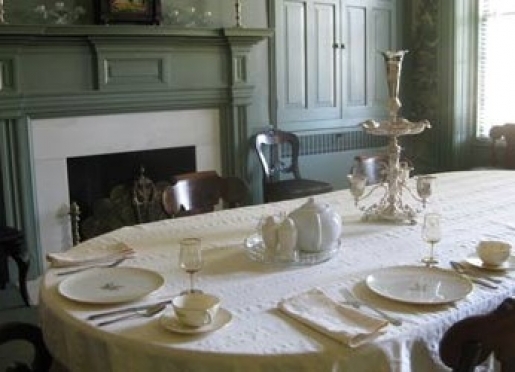 Guests may enjoy breakfast in the formal dining room, on the gallery, on the patio overlooking the gardens, or in the room. Lebanon is located on U.S. 68 an hour's drive southwest of Lexington. Used by Confederate General John Hunt Morgan as his headquarters during his raids on Lebanon, Myrtledene today offers slightly more relaxed environs for our guests. 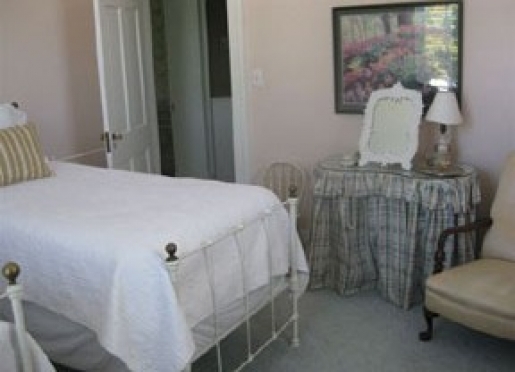 With two guest rooms, the house is completely furnished in antiques. 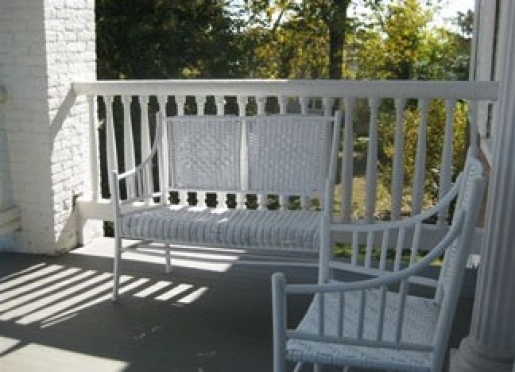 Guests are encouraged to make themselves at home and make use of the entire house and grounds. 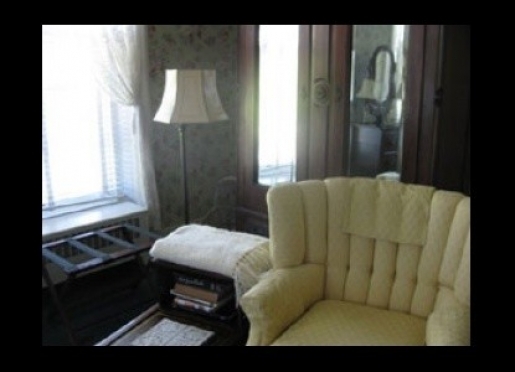 Phones, television, wireless internet service, a library, a refrigerator, and piano are here for our guests' use. The large yard with gardens, wisteria arbor, fish pond, swings, and hammocks are ideal for couples on a romantic retreat, readers looking for a peaceful spot, or children who need a safe place to play. "My husband and I recently took a road trip around Kentucky and Tennessee. 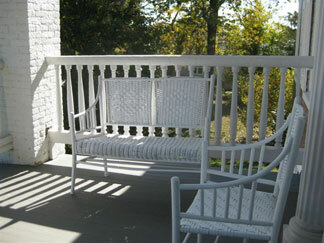 We chose Myrtledene B+B for its location just a few miles from Loretto, where Maker's Mark is distilled. We received amazing service from the moment we arrived. We were met by the innkeeper - a jovial man - and his two young sons (5 + 3 respectively) who carried our luggage from our car to our room upstairs. 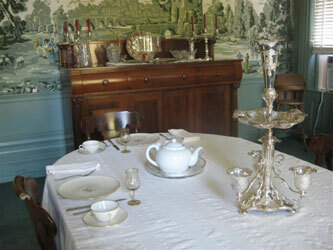 The room itself was decorated in Civil War era-style, which was very appropriate. The room was as large as it was meticulously clean (major points!). The only thing that might be an issue for some travelers is the size of the television, which was rather small. We weren't there to watch tv so it was more amusing than it was annoying. The adjoining bathroom was also very clean, with plenty of towels, toiletries and a hairdryer. There must be something in the Kentucky air that made my hair dry extra quickly throughout the trip - I hardly bothered to use the hairdryer. Breakfast was amazing - french toast with apricot sauce, fresh fruit, coffee and juice. We even enjoyed some entertainment as the innkeeper's youngest son played a game with us while we ate. I should add that this was encouraged by us and not necessarily a standard practice, in case you would prefer to be left alone. We thought he was adorable. Although our stay was brief, we enjoyed it very much. The innkeeper even gave us freshly baked oatmeal raisin cookies for our journey! 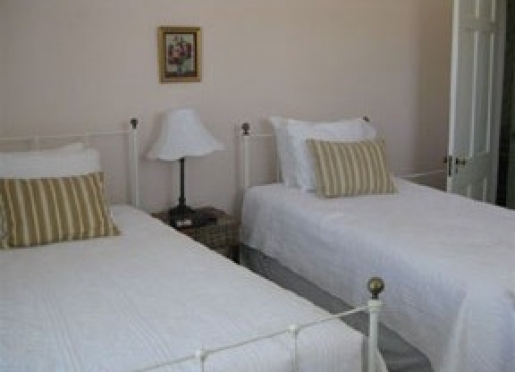 Myrtledene provides great value-for-money compared with accommodation choices in Lebanon. 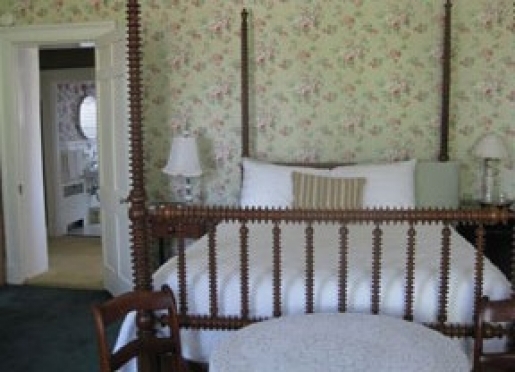 As an added bonus, the innkeeper and his lovely family will make you feel as welcome as an old friend."